In a previous lesson I explained the differences between classic and rapid spanning-tree and how rapid spanning-tree works. If you haven’t seen it before, I would recommend to look at it first before diving in the configuration. 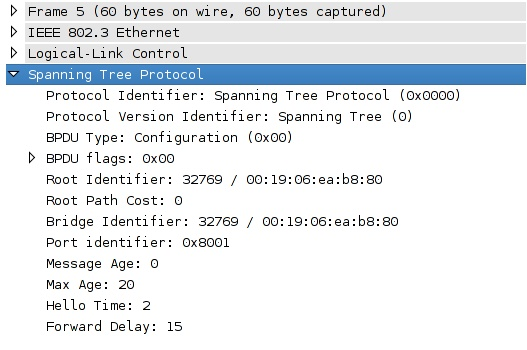 That’s it…just one command will enable rapid spanning tree on our switches. The implementation of rapid spanning tree is rapid-pvst. We are calculating a rapid spanning tree for each VLAN. I’m going to shut both interfaces on SW1 to start with. Second step is to enable debug on all the switches. The fa0/14 interface on SW1 will be blocked and it’ll send a proposal to SW2. Apparently SW2 thought it was the root bridge because it says it received a superior BPDU on its fa0/14 interface. It changes its fa0/14 interface to root port. The fa0/16 interface on SW2 will go into sync mode. This is the interface that connects to SW3. SW2 will respond to SW1 its proposal by sending an agreement. SW1 receives the agreement from SW2 and interface fa0/14 will go into forwarding. SW2 will send a proposal to SW3. SW3 will respond to the proposal of SW2 and send an agreement. SW2 receives the agreement from SW3 and the interface will go into forwarding. That’s all there to is it…a quick number of handshakes and the interfaces will move to forwarding without the use of any timers. Let’s continue! Here’s something new. SW2 has a backup port. Because of the hub in the middle SW2 and SW3 will hear their own BPDUs. You can use the debug spanning-tree bpdu command to view BPDUs are are sent or received. You will see the contents of the BPDU like above. It’s not very useful if you want to see the content of the BPDU but it does show us that SW2 is receiving BPDUs and sending them on its interfaces. If you do want to look at the contents of a BPDU I recommend you to use wireshark. It shows everything in a nice structured way. You don’t have to capture a BPDU yourself if you don’t feel like. The wireshark website has many pre-recorded packet captures. Let’s get rid of the hub and do something else…I’m going to simulate a link failure between SW1 and SW3 to see how rapid spanning tree deals with this. First I’m going to shut the fa0/17 interface on SW1. SW3 realized something is wrong with the root port almost immediately and will change the fa0/16 interface from alternate port to root port. This is the equivalent of UplinkFast for classic spanning tree but it’s enabled by default for rapid spanning tree. Uplinkfast can be enabled for “classic” STP but a similar mechanism is built-in RSTP. A similar mechanism is built in for RSTP. I am not understanding what you are asking. Could you ask this another way? If you are asking what this message means, I can try to help. This means you set (either via spanning-tree vlan 1 4096, or spanning-tree vlan 1 root primary). This is what it means when it says “prio cfg 4096”–the vlan was configured to be priority 4096. Ok i think i have found the issue here. I have configured udld mode aggressive on all the ports. So that is why when i admin down the port on SW3(e3/2-RP), the Root switch port SW1 (e3/0) goes into err-disable state! Since Root Switch port e3/0 will not receive any traffic, it goes into err-disable state. Finally, i just needed to bounce it, to work as before. Thanks so much for sharing your experiences with us. It’s great to learn from the learning experiences of others as it helps us all to identify similar situations in our studies and our jobs.